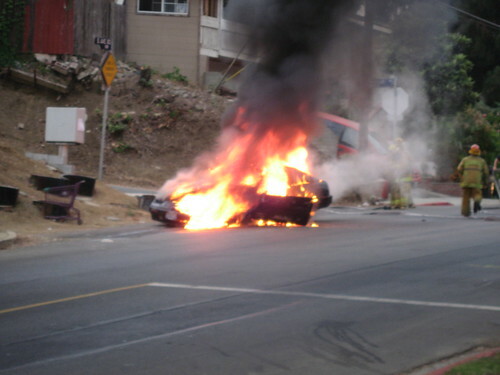 Depending on the cause of your overheating engine, ignoring it could lead to a car fire. Image from Flickr. Running an internal combustion engine is, speaking in terms of energy use, expensive. Even the most efficient gas-run engines use only about 38 percent of the stored energy of gas for powering the vehicle – the rest becomes waste heat. Engines are designed to operate within a relatively narrow range of temperatures, and if an engine overheats, it can cause all kinds of damage. Recognizing and repairing an overheating engine as soon as possible is one of the most important parts of good vehicle maintenance. When an engine starts overheating, a cascade of things start to go wrong. Most gasoline engines (not diesel) have a normal operating range of 195 to 220 degrees. At hotter than about 220 degrees, the engine may start misfiring as fuel combusts in places other than the combustion chamber. At 250 degrees, rubber and plastic parts of the engine start softening. At about 265 degrees, the aluminum, cast iron and metal components begin to soften, distort, stress. Boiling coolant can also cause the radiator to burst, the head gasket can be crushed, and old hoses can develop holes. Most engines have a dial or gauge that will show you at least the general temperature of the engine. You should keep as close an eye on this gauge as you do on the fuel. If you notice that the temperature is consistently above 225 degrees or if the “hot” warning light goes on, stop driving the vehicle. First of all, pull over and check the coolant levels in your engine. If the levels are low, top them off with coolant or water. Drive to a mechanic and have the vehicle checked out as soon as possible. Do not attempt to open the radiator cap until the engine has entirely cooled off – it is under pressure and could cause injuries. Leak in the cooling system – the most common cause, and most easily found with a pressure test. Issues with the thermostat – depending on the model of your car, this could be computer-controlled or mechanical. Cooling fan failure – check the belt and the fan clutch. Dirty radiator – if the airflow through a radiator is blocked by dust and dirt, it can overheat the engine. Overworked engine – if you are working the engine hard with an extra-heavy load, towing or driving fast on mountains in the summer, your engine may naturally overheat. I blew a hose on a chevy 2200, in heavy traffic and no safe place to pull over for a piece. the engine pinged and started missing by the time I could get off the road. after cooling down, i taped hose and filled with water, but it wouldn't run. the engine would spin okay, but smelled of fuel and won't fire. Prognosis? I have been hauling the same load for 3 years with my 88 jimmy 350 auto trans why would it just now start to overheat under the same load ?